Too Many Spiders - Yes Pest Pros, Inc. Too Many Spiders - Yes Pest Pros, Inc.
Spiders have their uses, but typically once they get into your home they’re going to have a hard time finding food. Most of their food sources are outside, and they may have either stumbled into your home by accident, in the pursuit of food, or because of outside elements. Whatever the case may be, while you may be willing to forgive the random spider on your wall, when you start seeing more or a lot of empty webs get left behind, then it’s time to rethink what might be going on in your home. Some are safe, some are not. There are a lot of different spiders that might appear in your home. Some of them are simply a nuisance, abandoning webs for you to clean up, or showing up when you don’t expect them (startling as well as annoying). However, some of them are poisonous and can pose a danger to both humans and pets. Common spiders include wolf spiders, which can be quite unnerving to see because they are hairy and can grow to rather large sizes. These spiders are hunters and may cruise your house in search of food. They can bite, but bites are not dangerous. Brown recluse spiders, however, are not to be taken lightly at all. These spiders are smaller and like to hide in locations such as sheets, clothing, and shoes. They are brown and have a fiddle-shaped mark on their bodies. Their venom is particularly nasty and can lead to a lot of damage such as open sores that can take a long, long time to heal. 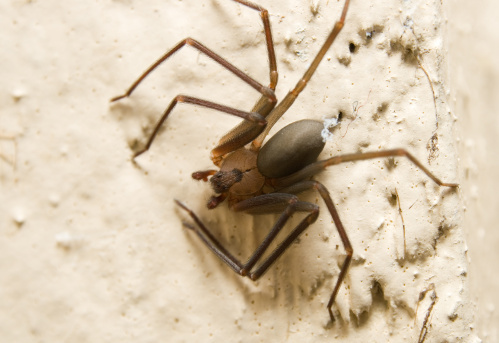 If left untreated, a brown recluse bite can be deadly. Keeping spiders out of your house is a win-win situation for everyone – and everything – involved. Spiders in your house will be eliminated and with the right inspection and repairs, you can keep spiders and other pests from coming into your house. They need to remain outside where they belong, and that is where spiders can do their job of eating other potential pests. You have a good pest control company for that job in your home. Contact a pest extermination company that uses environmentally responsible products for even better results that are safer for your home and your family as well. A quality inspection and treatment will leave your home free of spiders as well as other pests, and keep them from returning to your home.